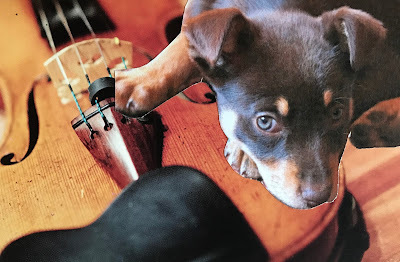 The Sydney Symphony Orchestra season doesn't seem to have an 'Opening Galah' anymore, which I assume has something to do with David Robertson's time schedule. But the early season gala with Vengerov was a very fine start to the year. The concert programme is no longer available on-line (hate that) ~ Brahms Violin Concerto followed by Tchaikovsky 5th Symphony, Vengerov soloist, David Robertson conducting. Limelight review is here. It was that good. He is technically astounding, no news there. I (also) went to a rehearsal and sat close, really close, though he didn't play his cadenza, a very showy affair, saving it up. Unexpectedly, I think I enjoyed the Tchaikovsky even more, which is a pretty silly thing to say, considering. But it was the surprise element that caught me and swept me up and along. The cellos and violas have swapped places, the horns are bunched and not linear, and the orchestral sound is very good and solid. Like the Germans K mused, even. The 5th is Tchaikovsky dealing with life's cards, the homosexual ones presumably. Robertson kept too much sentimentalism at bay, and while not matter of fact either, there was a truthfulness about the presentation that I found moving, a progression to resolution and acceptance. And Ben Jack's noble horn solos finally put that damn cigarette ad to rest, praise the lord. 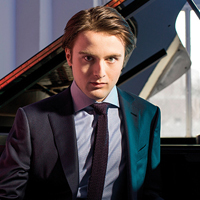 There's fame-preceding-him Daniil Trifonov himself, with much excitement all round. And also for the first time the elegant young Spanish conductor ex-percussionist Gustavo Gimeno, an Abbado protégé, conducting big stuff in Europe, Nth America and Japan, and what's more, moving into opera. I like Spaniards. The programme was Young Russians (I hope that links lasts; there's some good reading) : Prokofiev's Classical Symphony, Op. 25; Rachmaninoff''s Piano Concerto No 1, Op. 1; Shostakovich Symphony No 1, Op.10. Well, words fails me. He's cool, but incredibly likeable. The intensity of his relationship to the music, at whose service he is alone at, and the instrument is amazing. I was thinking if I closed my eyes when I reopened them he wouldn't be there, but instead morphed into a man-piano fantasy. He's incredibly intense; did I say that? He doesn't play the piano, as say Bronfman plays the piano, he becomes the piano; did I say that? The posture is strongly hunched, head so close to the keys as if there's a current between them, pulling him closer, till a wonderful arch of arm and hand, musically driven of course, eases him back and his body opens forth, as if letting doves fly into the heavens. I was, quite frankly, bewitched. There's much written about him, not the least by Alex Ross here. Gustavo Gimeno is a very welcome addition to the roster, may he return soon. The Prokofiev was most elegant and restrained, eschewing showy exaggeration. And the Shostakovich I thought wonderfully delivered. The thing with Shostakovich for me is it really needs to be heard live. It's such an immersive experience., the textures, details, and dimensions easily blurred but thrilling when fully realised. Here we had this amazing cauldron of ideas, bubbling away, with little spurts of the future flashing out, fleshed out, and I want to go back but I can't. But I can go to Wunderkinde's recital on Monday. Excellent. Tremendous resource! Thanks Yvonne.